A new era in fundamental physics began when pulsars were discovered in 1967. Soon it became clear that pulsars were useful tools for a wide variety of physical and astrophysical problems. Further applications became possible with the discovery of the first binary pulsar in 1974 and the discovery of millisecond pulsars in 1982. Ever since pulsars have been used as precise cosmic clocks, taking us beyond the weak-field limit of the solar-system in the study of theories of gravity. Their contribution is crucial as no test can be considered to be complete without probing the strong-field realm of gravitational physics by finding and timing pulsars. This is particularly highlighted by the discovery of the first double pulsar system in 2003. 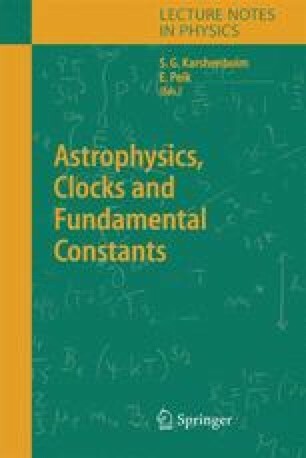 In this review, I will explain some of the most important applications of millisecond pulsar clocks in the study of gravity and fundamental constants.